Are you looking for a great walk, “in your backyard”? Ball’s Bluff, a combination of history and a special natural landscape is there for you. To a history enthusiast, Ball’s Bluff is known as the site of a Civil War battle. To a wildflower enthusiast, it is known as one of the best places in Loudoun County to see a remarkable diversity of spring wildflowers. These two facets of the park contribute to make the whole greater than the parts. As an historical ecologist, with training in botany, ecology and history, I look for interactions between history and natural features, and I find them to be especially striking at Ball’s Bluff. The natural setting influenced the location and outcome of the battle, as well as the continued survival of forest and wildflowers in this heavily developed region. For the backdrop, the Potomac River has been eroding the sandstone/siltstone bedrock for millennia, forming steep cliffs, the “bluffs” of Ball’s Bluff. As 18th and early 19th century farmers cleared land in the area for agriculture, they concentrated on the flatter uplands, leaving most of the steep land in trees. They did not, however, ignore these remaining forests. Moving beyond the cleared land, they cut wood for fuel, fencing and building, though they did not clear-cut or plow the steepest, rockiest areas. Historic photographs and plans of the 1861 battlefield indicate that while a portion of the area that is now Balls Bluff Regional Park was cleared and remained free of forest at least until 1886, most of the slopes down to the river remained in forest. However, after the late 19thcentury, even this upland area was left to regenerate into forest. A 1937 aerial photograph, found in the Loudoun County mapping department’s aerial archive, shows much the same natural boundaries as exist today, with red cedars or Virginia pines growing in small clearings, and beginning to regenerate forest. Both the steepness of the slopes and protection of the battlefield site effectively kept this area in forest as development spread from Leesburg. 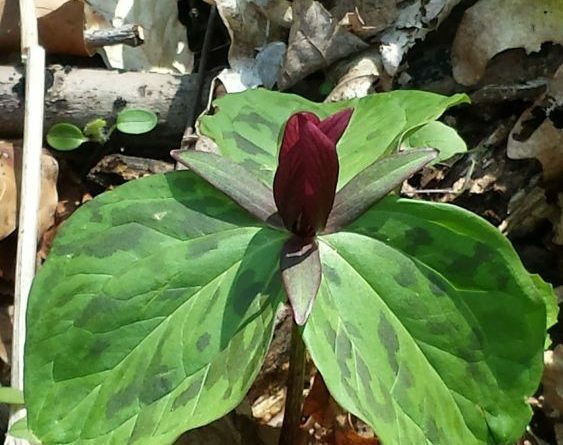 Today, the forestland on the slopes above the Potomac River provides several miles of hiking through hundred and 50-year-old forest, with an understory of abundant spring wildflowers which have never been destroyed by plowing. These plants are all perennials, whose roots are probably as old as the trees, maybe even older. If they had been destroyed by plowing, which happened in much of the county, they would have come back only very slowly from seed even as the forest regenerated. The area that was clear as late as 1886 formed a dense forest by the 21stcentury, but was clear-cut to reconstruct the landcover as it was at the time of the battle. This action dismayed botanists and naturalists, who valued the large, healthy trees there, but fulfilled the current concept of reconstructing historic battlefields to the conditions at the historic period. Fortunately, many of the very special wildflowers remain in the rest of the park and are there for our appreciation. Loudoun Valley High School environmental science students, led by Liam McGranaghan, are given the chance to appreciate this natural wonder every spring, and I encourage you to visit as well. In any season, it is a special place, with native trees—including at least five species of oaks, beeches, tulip poplar and hickories, two feet or more in diameter, pawpaw, witchhazel, ironwood and other understory shrubs, and at least some wildflowers blooming at all seasons. The best wildflower display is in late April/early May. Even in August, though, it provides a cool and inspirational walk. [Emily (Russell) Southgate is an historical ecologist, a local resident, and a Board Member of the Piedmont Chapter of the Virginia Native Plant Society. The second edition of her book, “People and the Land Through Time. Linking Ecology and History” is expected to be published in 2019. The first edition is available from Yale University Press. For more information about Balls Bluff Regional Park, go to novaparks.com/parks/balls-bluff-battlefield-regional-park, or for more history,.battlefields.org/learn/civil-war/battles/balls-bluff. In Our Backyard is compiled by the Loudoun County Preservation and Conservation Coalition. For more information about the organization, or to participate in the Rural Roads Initiative, go to loudouncoalition.org.